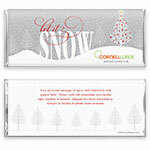 This charming holiday candy wrapper will be a delightful addition to your seasonal thank you gifts. 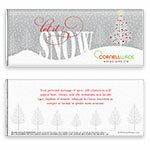 Design: Landscape with falling snow and red ornaments on a tree. Personalization: Front logo and back message.